It isn’t that men don’t care how they look but when shopping for clothes many guys are much more functional shoppers than women. This means that in a clothes store a lot of guys will choose a shirt with the right collar size and buy it, they will give little thought to any other dimensions: even if they did though it is very difficult to find a shirt that fits perfectly on the neck, chest, waist and arms. If you are a slightly odd shape especially you may find it especially difficult to find a shirt, this includes people who are tall and skinny or people who are fairly average but have large biceps or a thick neck. The internet though means that rather than every local store having to hold a range of what would be hundreds of shirts to have every combination in every design: EPIC ShirtMakers has been setup online to serve any man in need of a shirt with a custom dress shirt made to their dimensions, and they don’t even have to go near the shops. Buying custom dress shirts at EPIC ShirtMakers doesn’t stop at being able to choose any sizes you want, you can choose colors and fabrics as well to get the perfect custom dress shirt. Not all fabrics are the same, some are ideal for formal occasions, others better for work and some good for a smart casual evening out. Buying custom dress shirts online lets you choose the best fabric for your occasion and the fabric you like most. Some people like a fabric with a silky finish, others like an oxford weave’s texture and coolness. 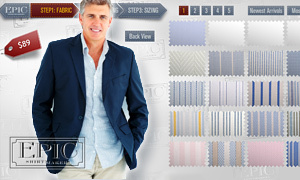 Epic Shirt Makers fabrics are all Swiss or Italian cottons of the highest quality both ion terms of feel and looks. The color and pattern of your custom dress shirts is important as well and buying at EPIC ShirtMaker’s website you can have a much better range of hundreds of designs compared to maybe a couple of dozen in even the biggest clothes stores. You may just want a white shirt but then there is white, off white, cream and several other types of white to choose from for your custom dress shirts. You can also choose two-tone materials to give a shirt that is one basic color a bit more texture and character and then there are of course stripes, checks and other classic designs from which to choose. 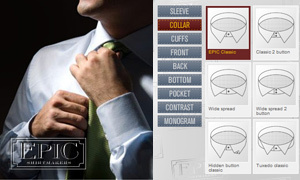 Also buying your custom dress shirts online at EPIC ShirtMarkers you will want to choose the styling, the little details that make your custom dress shirts truly unique; short or long sleeves, different collars and cuffs including those with buttons or with cufflinks. Pleats along the back will affect how the shirt looks on you so consider what you think you look best in, pockets on the front can be useful of course but some people think they spoil the look. Lastly you may want to consider a contrasting color on the collar, cuffs or both: usually white.